Georgina Musqua has certificate of Human Justice from University of Regina. She took her practicum with Beardy/Okemasis First Nation with the Justice Community Program as Acting Community Justice Co-ordinator. Georgina is a member of Keeseekoose First Nation, Treaty 4. She is a member of the Saulteaux tribe and speaks the language fluently. She is survivor of the St. Philip’s Residential School which was located on the Keeseekoose First Nation Reserve. She is the daughter of the late Roy Musqua and Nellie (nee: Brass) Musqua. Georgina is mother of four daughters, the oldest daughter deceased in 1990. She took custody and raised her two young grandchildren, age 2 and 4. She is currently raising 5-year-old great grandson since infancy. She is a grandmother/ great grandmother of many. She loves spending time with her family and cooking for the special events throughout the year. As a young mother with her deceased husband, took their daughters to the surrounding powwow, as well to the many ceremonies at Keeseekoose, Cote and Key First Nation. 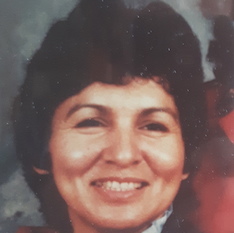 She is a proud, loving, gentle and kind Saulteaux woman who provides leadership and guidance for her children, grandchildren and other youth she works with. She practices her cultural in everyday life and strive to set an example for others. She looks for the good in all human beings no matter where they come from or who they are. She maintains a positive, respectful approach with her co-workers and with patience with those who are sometimes difficult to work with.